Adding their voices to the growing call for justice, tens of thousands of protesters will take to the streets on Saturday in a National Day of Resistance against police brutality, racial profiling and American’s broken criminal justice system. Marches in New York City and Washington D.C. are expected to draw tens of thousands of people while other actions are planned in communities across the country. The protests are part of a growing wave of anger following the recent grand jury decisions to not indict St. Louis police officer Darren Wilson and New York police officer Daniel Pantaleo for the killings of Mike Brown and Eric Garner. Images and quotes from the nationwide demonstrations are being shared on Twitter. 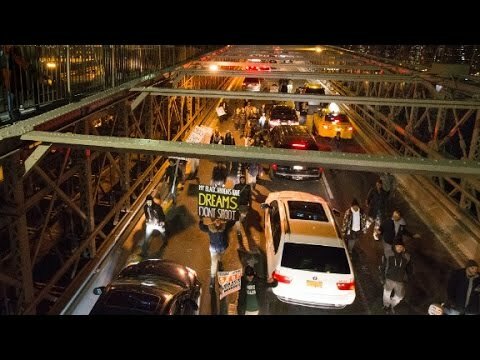 “We have a moral obligation to take to the streets and call for the deep changes that will allow us and our communities to live free from fear and suffering at the hands of the police,” 19-year-old Umaara Iynass Elliott, one of the organizers behind the Millions March NYC demonstration, said in a press statement. Beginning at 2PM, protesters in New York will march from Washington Square Park to the NYPD headquarters. The families of Eric Garner, Mike Brown, and the families of recent other victims of racial violence, Akai Gurley, Tamir Rice, Trayvon Martin, were a joined by an estimated ten thousand people who marched in Washington D.C.. Under the banner “Justice for All,” the peaceful march was organized by a contingent of established civil rights groups including Reverend Al Sharpton’s National Action Network, the Urban League, and the NAACP. According to organizers, more than 45,000 individuals across the country have committed to take part in the national demonstrations.